WALK TO THE BEACH! Adorable 3 bedroom home in the quaint neighborhood of Fishers Landing, close by Madaket and a short walk to Eel Point beach. This light and bright home is set back from the road and looks out into pine woods. 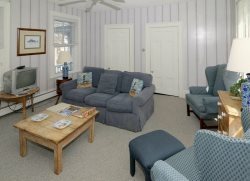 Relax on the wrap-around porch, play tennis at the private Fisher's Landing tennis courts, or take a stroll across conservation land to the beach at 40th pole, which leads out to a fisherman's haven at Eel Point. The neighborhood is perfect for families with young children who can bike around the one-way winding road safely. 4 Night minimum stay off season, some 3 nights stays are allowed. Monthly rental available in the winter months. Monthly rentals are plus utilities.